Becker believes that human civilization is an elaborate defense mechanism that helps people cope with their mortality. People desire to create or become part of something which they feel is eternal as opposed to their physical body that will one day die which convinces people that their lives have meaning and a purpose. Becker extensively discusses mental illness and essentially believes that it is caused by these people’s inability to create a strong enough “hero project” and are therefore being consistently reminded of their mortality and insignificance. Becker also believes that traditional “hero systems,” such as religion, are no longer convincing in today’s age of reason. 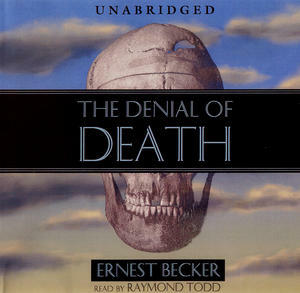 Becker hopes that the gradual realization of humanity’s innate motivations (death) can help bring about a better world. A somewhat dark and disturbing book but its aim to make you aware of people’s main motivation to cheat (or at least put off thinking about) death contains a powerful message. By being aware that humans are terrified of death and often hellbent on finding a way to make their legacy immortal, Becker argues that one can better understand oneself and others. This entry was posted in Books and tagged Death, Ernest Becker, Thought-provoking on November 25, 2014 by Blas.